About Us – Plomberie Goyer Inc. Constantly looking for technological innovations, For ocver three generations we have been known for the quality of our products and services and for the satisfaction of our customers. Goyer Plumbing has the mission to offer to all our residential and commercial clients, products and services of quality. Everyday, we do our best to remain a leader of sales, installation and service of plumbing, heating and ventilation. We put all our of efforts to satisfy the needs of our customers with our team of experts, specialists and technicians. The satisfaction of our customers is the key to our success and we never stop working at it. For all projects, we analyse the specifics needs of our customer and we give a follow up during the work. When the project is over, we offer a personalized after-sale service and for the peace of mind, we also have a 24 hours / 7 days service. It is with great pride that plumbing goyer has successful its audit of the in order to renew its authorisations for the installation of boilers and modification and repairs of pressure pipes. These authorisations according to specified standards and codes; CSA (Canadian Standard Association) and asme (American society of mechanical engineers) are very demanding and require a rigorous quality control manual. 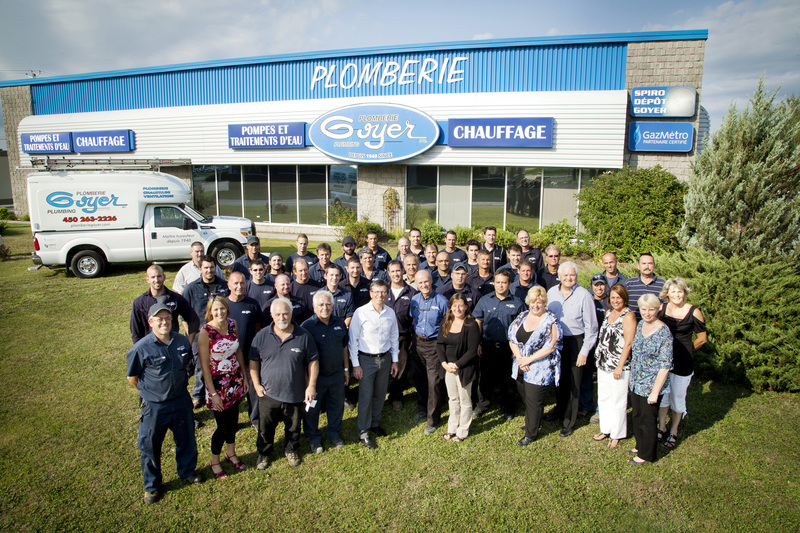 This allows plumbing goyer to continue manufacturing in workshop and installation or delivery across Quebec and elsewhere. Shortly these authorisations will be mandatory for all major contractors in the field and again plumbing goyer demonstrates its leadership in mechanical engineering. Thanks to the whole team you are the best! According to the “Loi sur le bâtiment du Québec”, a contractor who installs plumbing and heating must have a licence to prove that he specialized in that area of work and gives him the right to bid, to execute or to ask to an other contractor to execute the work. To obtain the licence, a contractor has to succeed in a serious qualification procedure. The organism who deliver the licence is the Corporation des maîtres mécaniciens en tuyauterie du Québec (CMMTQ). From a few people in 1940 to the 80 employees that we have now, we always look towards the future. Our succes is based on our team and on our innovations. The direction and the administrative team of Goyer Plumbing support all the administrative tasks including; marketing, human ressources and the accounting department. No matter what is your improvement project, you will find everything you need under the same roof : ideas, advices, quality products and specialized services. We are tuned in your needs. Thanks to our specialists robust team qualified in plumbing, heating (gas and oil) and to our staff of warehouse, we can guarantee you quality services, meeting the standards of the industry as well as your requirements. Goyer Plumbing inc. and its team are proud to be associated to different actors of the development of our area by contributing financially to the support of its associations, cultural events and sport teams. We act locally to support people who have trusted us since 1940. From the few people to the 80 employees that we are now, we always look towards the future. Our success is based on our team and on our innovations.